Complete beehive with 2 Deep 9⅝" + 2 Medium 7⅝" supers. A fully assembled and ready to use complete hive with 2 deep brood boxes and 2 medium Illinois honey supers. My Technoset hive has survived over one year in Maryland and is going very well. The 5 wood hives that were next to my TS hive all died out, leaving my Technoset as the sole survivor. I have since purchased another Technoset hive. 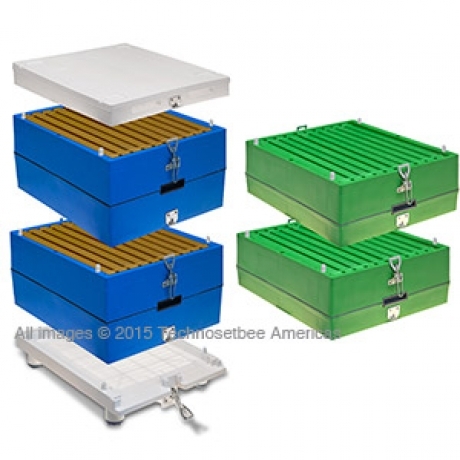 Technoset hives are very well made and heavy duty construction. I do not want to deal with the problems of wood hives. The Technoset hives lock into place with adjustable locks and several (I use 4) locator pins to keep the boxes lined up.